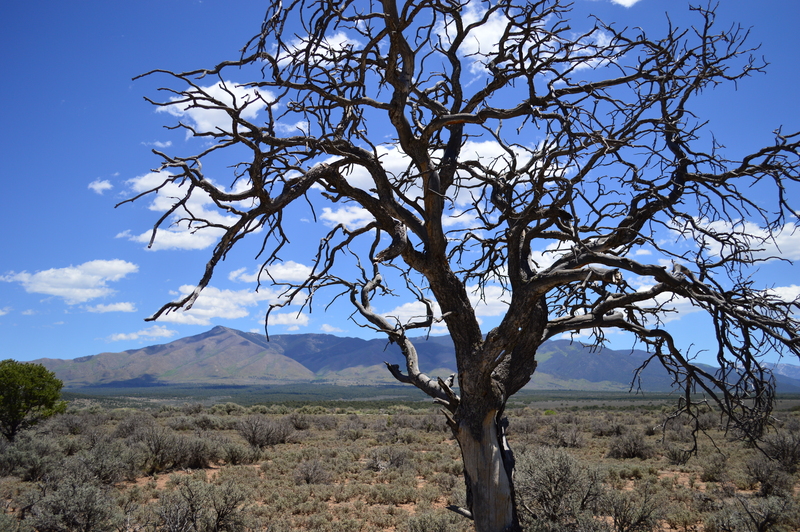 After two nights at the Columbine Campground, we decided to visit the Wild Rivers Recreation Area, which had been recommended to Deas by the BLM (Bureau of Land Management) office that we had stopped by in Santa Fe. 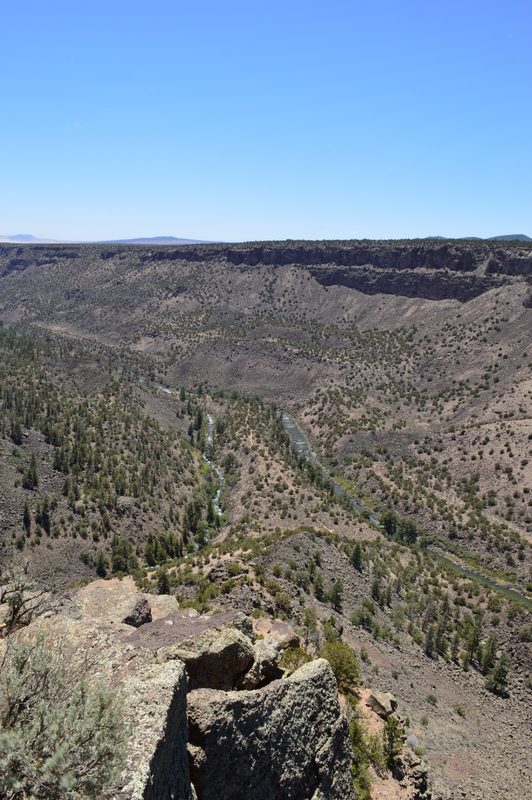 The Rio Grande River and the Red River join together in this area, and since each has its own gorge, the scenery promised to be exciting. The good news was that it was only going to be a 45-minute trip. The bad news was that we had a 65-pound dog on antibiotics, which meant an slightly out of whack tummy. And hence a VERY smelly RV trip. As we pulled into the area, we could see the enormous Rio Grand Gorge about 100 feet to the side of the road. 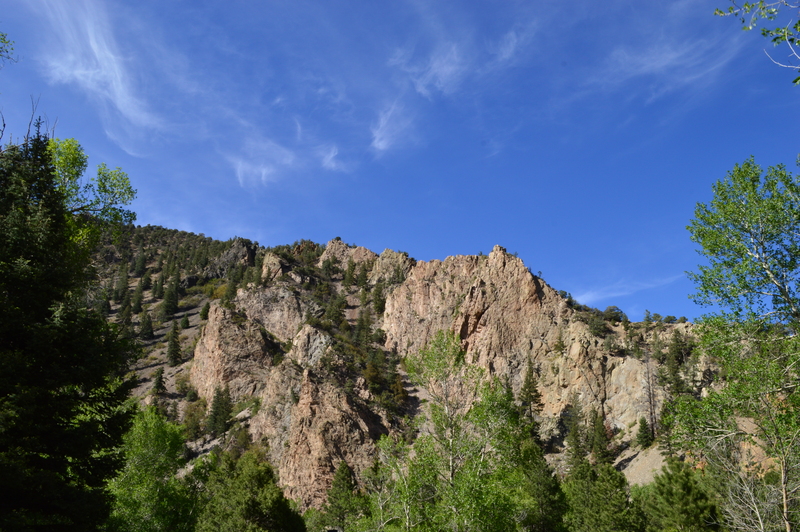 I instinctively felt myself leaning into the RV, away from the gorge! Which was pointless since my weight accounts for about 0.5% of the RV weight, I doubt I was having much effect. I’m not really afraid of heights, but it was little disconcerting to see that gaping hole right on the side of the road! Well, this turned out to be possibly our favorite campsite of the entire trip. There were no hookups in this park, which means that we had to dry camp (no water, electricity, or sewer.) But at $7 a night, it was money well spent. The other amazing thing about this place is that it was practically deserted. There are several different places you can camp, each with multiple campsites, but we only saw about 5 other people. Why this is, I have no idea. This is a hidden gem and Deas really didn’t want me to write about it because we loved having the place practically to ourselves! Our first night there, it was incredibly windy. In fact, it was so windy that we couldn’t open up the slides of the RV! So we did a little walking around, and tried to watch the sunset, but the wind was so strong we soon retreated to the shelter of the RV. Since the slides were closed, it was a little tight in there, but we were managing okay, at least until Nikki’s antibiotic tummy kicked in again. We had to laugh at the ridiculousness of it! Sadly there were a couple of out of control wildfires in the area. They weren’t any danger to us, but with the strong wind we still got a lot of smoke in our campground that night, even though the fire was 80 miles away. 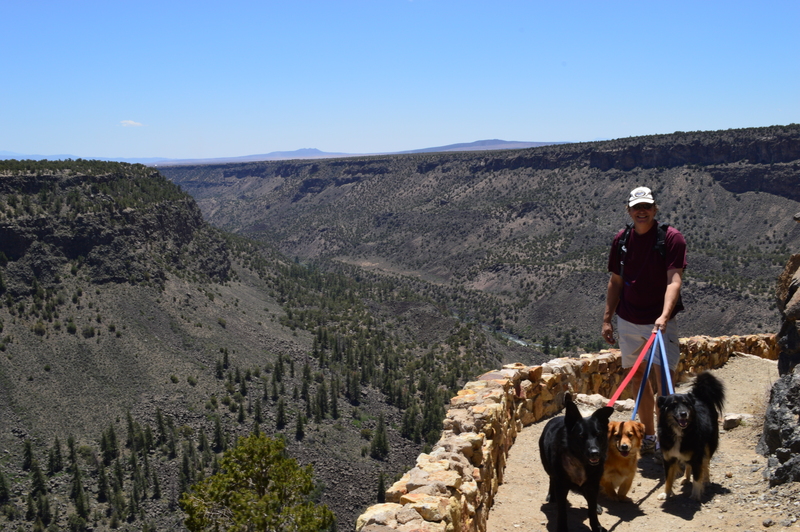 The next morning, we decided to take one of the many available trails down into the Rio Grande Gorge, and took all 3 dogs with us. 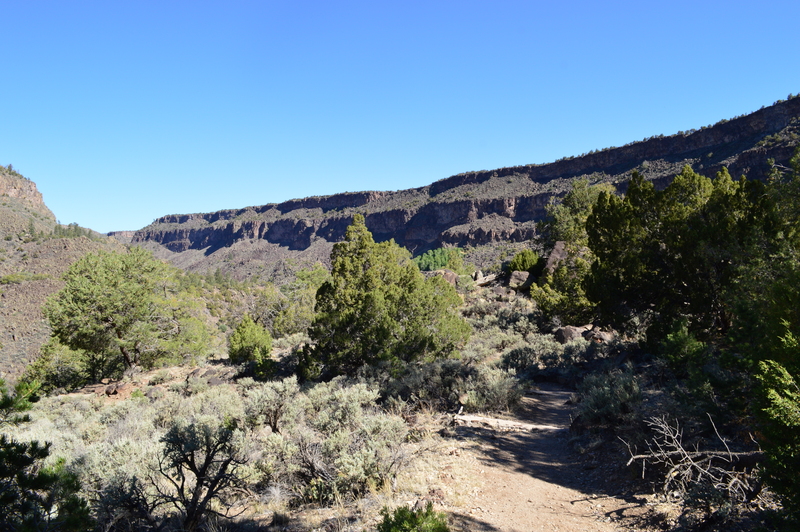 The hike down into the gorge was pretty steep and rocky, and since I have a knee cap that doesn’t like to stay in place, I was pretty slow. But once we got to the bottom, we were able to hike along the river for several hundred feet. The hike back up the top was also very steep, and poor Shorty was the one slowing us down this time! He made it, but we could tell the next day he was pretty sore. A 4 mile hike with 700-foot elevation changes each way was great for us, but for short little Corgi legs it was probably a little too much. I’ve got so many photos I want to share, but we’re about to head out to a new campsite, so I’ll have to post some more tomorrow. But here are a few of my favorites! Looking forward to meeting you guys at Alpen Rose! We are in site 80, stop by and say hello! 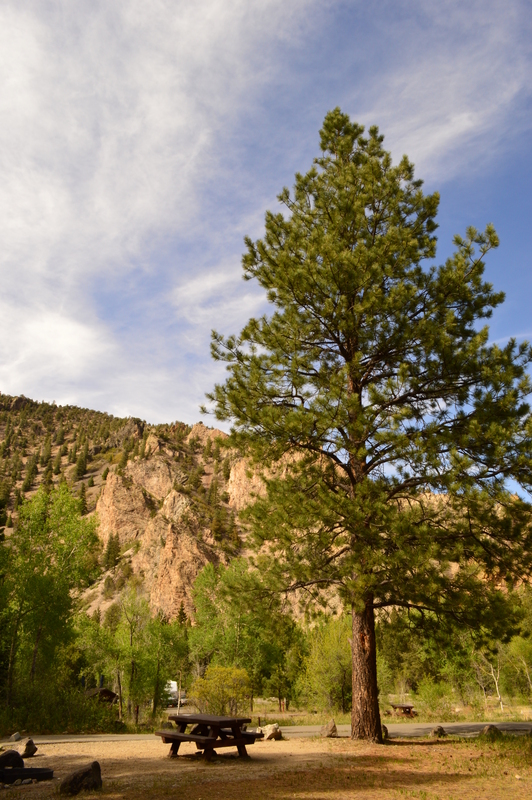 Next Next post: Colorful Colorado, and our first boondocking experience!